We’d love your help. Let us know what’s wrong with this preview of 8 Keys to Safe Trauma Recovery by Babette Rothschild. Trauma recovery is tricky; however, there are several key principles that can help make the process safe and effective. This book gives self help readers, therapy clients, and therapists alike the skills to understand and implement eight keys to successful trauma healing: mindful identification of what is helpful, recognizing survival, having the option to not remember, cr Trauma recovery is tricky; however, there are several key principles that can help make the process safe and effective. 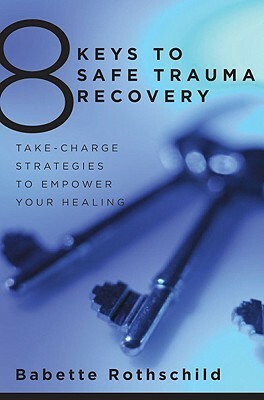 This book gives self help readers, therapy clients, and therapists alike the skills to understand and implement eight keys to successful trauma healing: mindful identification of what is helpful, recognizing survival, having the option to not remember, creating a supportive inner dialogue, forgiving not being able to stop the trauma, understanding and sharing shame, finding your own recovery pace; mobilizing your body, and helping others. To ask other readers questions about 8 Keys to Safe Trauma Recovery, please sign up. Whether you’re dealing with your own trauma recovery, or are a therapist helping others through theirs (or both), this book is essential reading. This respectful tone nicely carries the valuable information and insight offered throughout the book. Key Two: Begin with your epilogue…you made it! •	Give ample time to Phase I (stabilizing) work. •	Learn to pare down step size. •	Do not bypass current trauma to focus on past trauma. •	Do not assume that what was helpful for you will be helpful for your clients. •	Do not allow clients to push you to address memories with them prematurely, or to take any other steps you do not believe they (or you) are ready for. •	Maintain continuity of care. •	Do not forget to take care of yourself. Without a doubt, I feel she has been able to deliver this hope, and I highly recommend this book to anyone wishing to effectively navigate the trauma recovery process. This is a simple book, but not simplistic. A rare beast indeed, and for that reason I can recommend it as a starter book to anyone who wanting to know more about trauma recovery. Babette Rothschild knows her stuff and I trust her writings. For people who have been in therapy for a long time, or have researched PTSD, this book probably doesn't say anything you don't already know. There may be some practical exercises that are new (and this book is rich on examples of different exercises to try ou This is a simple book, but not simplistic. A rare beast indeed, and for that reason I can recommend it as a starter book to anyone who wanting to know more about trauma recovery. Babette Rothschild knows her stuff and I trust her writings. This is a self-help book for people who have suffered trauma. Babette takes the reader through eight “keys”, or pieces of advice, to guide the reader through their recovery. However, the book is not just for sufferers – friends, family, and mental health professionals can all get something out of this book. It is very well-written – concise and readable but never overly simplistic. Highly recommended for anyone wanting to learn about practical trauma recovery. My response to this book is deeply personal. Suffice to say, if you have suffered any trauma this book is for you. If you are suffering from PTSD, this book is for you. But only if you WANT to recover. This is a pretty spectacular book. Babette Rothschild lays out eight different keys a person can attempt to process their PTSD or trauma in a direct, easy to understand way. I appreciated that Babette is not only speaking as a therapist with a legacy of experience behind her but as a survivor of trauma herself. For anyone that's dealt with the effects of trauma, in and out of therapy, it's often an experience where logic does not match up with the emotions felt and internal processing...ie, I KNO This is a pretty spectacular book. Babette Rothschild lays out eight different keys a person can attempt to process their PTSD or trauma in a direct, easy to understand way. I appreciated that Babette is not only speaking as a therapist with a legacy of experience behind her but as a survivor of trauma herself. For anyone that's dealt with the effects of trauma, in and out of therapy, it's often an experience where logic does not match up with the emotions felt and internal processing...ie, I KNOW I'm not in danger but I FEEL like I'm in danger and thereby react as if I am in peril. Pretty maddening and very frustrating. Through the eight keys, Rothschild lays out different strategies a survivor can practice to actually process the trauma out of the body and to build up certain muscles to counteract flashbacks, anxiety, and triggers. Another aspect I appreciated is that it's emphasized that if one of the keys doesn't "fit" you and you have an aversion to it, then skip it. Do a different one. Also, one doesn't have to KNOW what's happened to them or be forced to remember the events in detail to process the trauma. Babette Rothschild doesn't claim that the keys are "quick fixes". It takes work and practice to for them to take affect. Though work is involved, the exercises at the end of each chapter are do-able. This is a great book for anyone recovering from trauma. This is also a fantastic book for therapists to have available for clients who may have experienced some trauma--it provides safe, supportive steps for people to take at their own pace. My therapist recommended this book and I am so glad. I've taken it really slowly so I could reflect on each chapter and introduce ideas slowly into my life through PTSD recovery. It is a very easy and practical read with honest and helpful ideas that you can accept or reject, depending what you do and don't find helpful. It is also very holistic and I have found different chapters helpful at different times in my recovery. It has helped equip me with tools that will help me with stress, anxiety, My therapist recommended this book and I am so glad. I've taken it really slowly so I could reflect on each chapter and introduce ideas slowly into my life through PTSD recovery. It is a very easy and practical read with honest and helpful ideas that you can accept or reject, depending what you do and don't find helpful. It is also very holistic and I have found different chapters helpful at different times in my recovery. It has helped equip me with tools that will help me with stress, anxiety, dissociation and depression that is or is not connected to the trauma for the rest of my life. Easy to read, written in a calm and straightforward tone. As a counsellor I find Rothschild's approach to be practical and client-focused, and as an individual, find some of the exercises here very useful indeed. I'd recommend this book to anyone working with vulnerable people (many of whom might have experienced trauma), and to anyone who has experienced trauma themselves. Excellent book explaining trauma, recognizing it in one self or others and overcoming it... very big help and clear advice... highly recommend this book for anyone wanting to understand trauma. This was a very helpful book! It also was very accessible. A very useful read for me trying to improve my understanding of trauma rehabilitation, and I'm sure it's an even more powerful read for someone who has survived trauma. Great addition to my mental health resources and library. I agree with the other reviewers. A simple, gentle, friendly, and insightful intro book. Particularly good for the genre. (I tend to get impatient with self-help and prefer reading books for clinicians and research articles, as they go into more depth; and I'm a big nerd.) But this book is very good at what it is, and accomplishes exactly what it sets out to do. As a trauma survivor, this has been the most helpful book I have read. Recommended by my therapist, we worked together on some of these principles, and I worked on some on my own. After a few months I feel more stable and less triggered. I recommend this book to anyone who has had a traumatic experience, whether great or small. Many of us will encounter a traumatic situation throughout our lives. This book is a very practical guide to healing from a trauma. It's also good for family and friends who know someone who has experienced a trauma. Comprehensive, easy to follow, easy to digest. Very practical and helpful! You are the goddess of common sense wisdom in trauma therapy. If I could just remember everything you write, I would be the best trauma therapist ever. targeted more at survivors than clinicians, so not too useful for my purposes, but probably pretty user friendly for survivors. Simple. Educational. Empowering. Helpful with day-to-day life. The best trauma recovery book I have ever read.